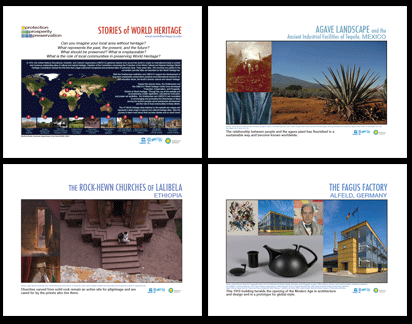 Protection, Prosperity, and Preservation: Stories of World Heritage Teacher Guides introduce world heritage and multi-cultural understanding in the classroom and the school. The guides provide teachers with curriculum-based, multi-disciplinary lessons based on the National Curriculum Standards. Lesson plans provide guidelines for exploring world heritage and multi-culturalism, environment and conservation, civic ideals and practices, and English Language Arts as well as more specific areas of geography, urban studies, agriculture, recycling, and conservation; these are just some of the academic areas covered. Discussion guides, problem solving exercises, and hands-on activities help students develop critical thinking skills. Accompanying the teacher guides is a poster set that can be used in the classroom to expand the virtual exhibition and enhance visual learning. The posters include photographs of the wonderful natural and cultural treasures that are highlighted throughout the Protection, Preservation, and Prosperity: Stories of World Heritage site. The set can be easily downloaded and can print up to 19.5 x 28.5 inches. More information is available in the Exhibition Handbook. The World Heritage Game is an entertaining, interactive way of exploring the life of a World Heritage site. Operating a natural or historical tourist destination is more than just opening the gates and letting in the people. Special projects, unexpected events, and even natural disasters can often complicate, and add excitement, to the running of a world class site. In the World Heritage Game, almost anything you can imagine could happen, does. And, when you have experienced all our scenarios, make up some of your own to keep the fun going!